To commemorate our 75th anniversary in May FOC is holding a month-long on-air event featuring at least 45 special FOC-suffix calls. These will include GB75FOC, a special anniversary call for our club station. (GC4FOC will be used when operating from Wales, GN4FOC from Northern Ireland, GP4FOC from Guernsey, GS4FOC from Scotland, and GT4FOC from Isle of Man). A list of who is on the key of each special UK call each day can be found here. There will be many other FOC calls on the air all month from outside the UK, including some exotic locations such as 4X, 5B, 5T, 7Q, A6, HZ, KH6, V3 and VQ9. Thanks to your donations, I could buy much better server. Now HamQTH VPS (virtual private server) has 3GB RAM and 90GB HDD. The old server has only 1GB RAM. I did tons of optimization but last few months the server was overloaded most of the time. 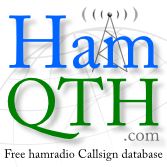 I'm going to move HamQTH to new server tomorrow (2012-09-12) early morning local time (around 02:00 UTC). It will be offline for 30 minutes or so. I already tried to move whole database (almost 4GB),users data (over 15 000 files), small programs which are running on background like ADIF import, FCC daily transaction import, DXCC XML search, utility that collects spots from RBN and DX cluster, another utility that reads spots directly from DX spider data files and do some statistics (DXCC, LoTW, eQSL) before stores it into database. Also tried to move scripts like auto backup, download eQSL, LoTW and DXCC tables etc. It worked quite well but I had to do some tweaks because new server is running on Ubuntu 12.04 server with MySQL 5.5. Older server has Ubuntu 10.04 with MySQL 5.1 installed. I must say, new sever is far faster than the old one. I did some tests and it's excellent. From 3GB of memory I gave 1.8GB only to MySQL to cache indexes and data. So please fingers cross. I'll need that. I would like to thank you for donations. Without them, it wouldn't be possible to buy this new server. Now I can add more new functions because I won't be limited with 1GB of RAM. Thank you!! New version of HamQTH.com is online! It seems that HamQTH server needs upgrade which costs $300. I already have $180 and need $120. It would be great if you could make small donation. Thank you! CQRLOG website is back online! What fo you thing about new CQRLOG home page? Do you like it? Please let us know. Thank you! We are moving cqrlog.com to our server. The page will be offline or even unavailable for day or two (because of very long TTL on old DNS server). Please be patient.